I really like 'Jhuk Gaya Aasman'. Lots of good stuff, not necessarily spectacular, but with a fun feel throughout. 'Unse Milee Nazar' is happy sounding pop'n'roll (sung by Lata for a change), 'Kisiki Jaan Lete Hain' is the energetic cabaret number (Asha and Helen, natch), 'Sacha Hai Pyar' has a nostalgic sounding melody with a bit of a Parisian feel, 'Meri Ankhon Ki Nindiya' is essentially traditional but with charming, tinny sounding pipe-organ (?) breaks... almost everything's worthwhile on this one. 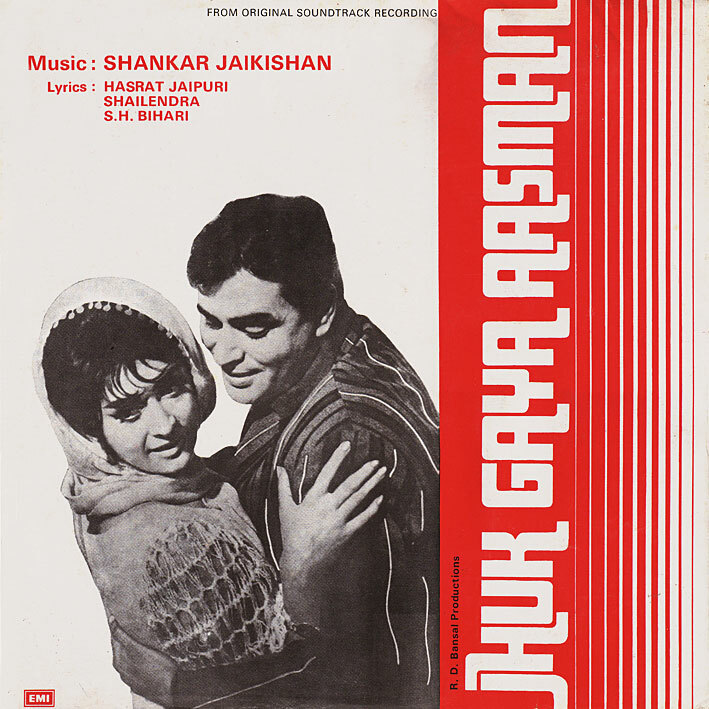 From a period when Shankar Jaikishan made many a great thing, so it's no big surprise. I liked this film, a remake of Heaven Can Wait. Songs are lovely! No it wasn't, Heaven Can Wait (original Ernst Lubitsch version) was made in 1943. No, Heaven Can Wait (1970s version) and Jhuk Gaya Aasman were both remakes of Here Comes Mr. Jordan. The Lubitsch is unrelated, I just got them confused. Also, we sure would appreciate to be featured in your blogroll. I stumbled here looking for Vijeta and thanks you to I am wearing a stupid grin on my face as I type this out. If I may ask, how are you converting LPs to MP3? I have 400+ records but no player. Assuming I can lay my hands on one, how do I convert the songs? I lucked on your website, and am glad you're providing such an amazing service. I've always noticed that parts of the Bollywood LP tend to be overlooked when making the CD version (like instrumental introductions to songs). Unfortunately I couldn't download MP3s from Jhuk Gaya Aasman. Have they been taken down? Nope, still there (link in 1st comment). Try one of the other links maybe?